The Burthorpe Games Room offers unique RuneScape-style games that are based on board games that you have probably already played before. You can challenge the other players in the room to the games, gain rank and possibly even become a Game Room "Legend" in this Activity. The Burthorpe Games Room is located in the underground basement of the Burthorpe Castle. 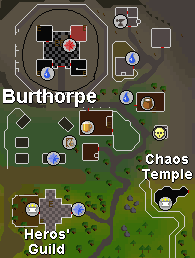 The village of Burthorpe can be found just north of the Heroes' Guild. You can also use a Sapphire Games Necklace to teleport directly to the game room. When you enter the game room you'll find yourself in a dungeon-like area. The Bartender named Sam will tell you a bit about the games, and you can buy a drink or 2 from him. Your ranking represents your skill in the Burthorpe Games Room. Once you defeat a person at a game, your ranking will increase by a number of points, and if you lose at a game, your ranking will go down. Everyone starts off with 1,000 points to their ranking. If you beat someone with a higher ranking that yourself, your ranking will increase by more points that if you win against someone with a lower ranking. If you lose against someone with a higher ranking, you'll lose less points than if they had less points than you. When your reach 1,500 rank, you'll have the option of playing the games upstairs. This means that more skilled players can challenge each other to games. Instead of playing right where you stand, you will play your game at the tables in the large room downstairs. 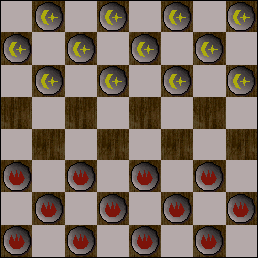 There are currently 2 different kinds of games that you can play in the Burthorpe Games Room: Draughts and RuneLink. Eventually the rooms will be expanded and more games will be added, as long as the rooms continue to be popular. You can challenge a player to a game by right-clicking on them and selecting the "Challenge" option. then just select the game that you wish to play, set the rules and accept the challenge. There are also dedicated rooms to each of the games, where you can only play that kind of game. While in a game-specific room, you'll see the player's total skill ranking, rather than their combat level. Draughts is much like the game of Checkers. Each player gets a specific Rune to use as their pieces, which are lined up on either side of the board. The game pieces can move forward diagonally and can only jump other pieces diagonally. Just drag the piece that you wish to move to another square or jump your opponent's piece. Once a piece reaches the end of the board, it becomes a King and is able to move both forward and backwards diagonally. The dedicated room for Draughts is in the southwest corner of the Burthorpe Game room. 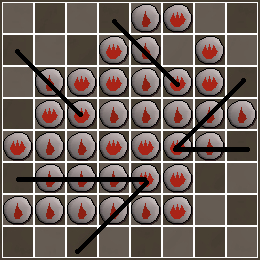 RuneLink is a game much like Connect-4. The players both get a different Rune for their pieces. You just click on any column that you wish and your piece will slide down to the bottom. 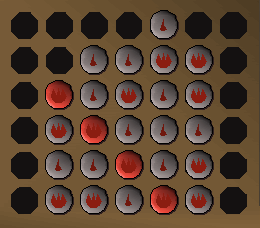 The first player to connect 4 Runes either diagonally, horizontally, or vertically wins the game. You can find the dedicated room for RuneLink in the southeast corner of the games room. 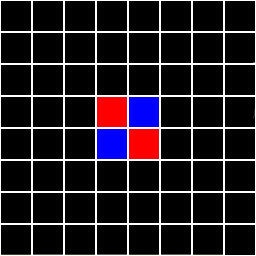 Once you click on it, another line will appear, completing a square. Your Rune will appear in the box. Runeversi is a game in which the objective is to make the board filled with the most pieces that you have. For 'veteran' players who played RuneScape Classic and remember the multiplayer game called "Slimewars" on the Jagex website, you'll know how to play. 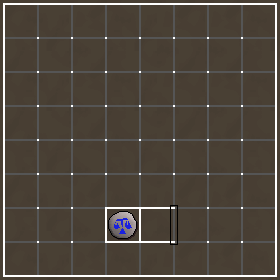 You can move any direction, but it must have a Fire Rune, Water Rune or a free space in that direction. Other than playing the games in the Burthorpe Games Room, there are other thingsthat you can do. Sam the Bartender and Rachael the Waitress will sell several beverages, including Asgarnian Ale (their specialty), Dwarven Stouts or Wizard's Mind Bombs for 2gp each. You could have a party of tournament with your friends in the game room too. By clicking on a game table that's being used by other players, you can watch their game to see who's winning.